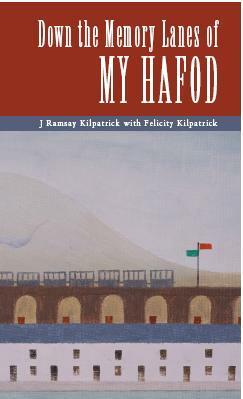 Since the publication of Down the Memory Lanes of My Hafod in November 2008, hundreds of people have been touched by the recollections of J Ramsay Kilpatrick. Felicity Kilpatrick’s appearance on Roy Noble’s afternoon show in March and a generous double-page spread in the Evening Post in the same week led to a flurry of activity at Waterstone’s when friends old and new battled through rain showers to buy signed copies of Down the Memory Lanes of My Hafod. Complimentary copies sent to the Central Library in the Civic Centre in Swansea led to further purchases and there are now more than twenty copies available for borrowing in local branch libraries, including reference copies in the Local Studies section. Not long after the launch of Down the Memory Lanes of My Hafod, every borrowable copy was on loan! Interest surpassed all expectations throughout 2009 and continues to gather apace. Following the enjoyable day with Mr Rees’s ‘Stars’ at Pentrehafod in December, Felicity was invited to return to speak to groups of teachers at Pentrehafod’s Literacy Day in the spring. The sessions were enthusiastically received and she was invited back to talk to Year 7s on ‘Welsh Day’ in July. Of particular interest was a pair of hobnailed boots, kindly loaned by the Regimental Museum in Brecon. J Ramsay Kilpatrick recalls having to learn how to walk without skidding over the metal plated floors in the works on his first day at work at the age of 14. It is detail such as this that really brings to life the lives of the men who worked in the metal industry, helping local children connect with their community’s past. In June Felicity was invited by Marilyn Jones, Local Studies Librarian, to talk at Swansea Central Library and spoke to a capacity audience on a hot summer afternoon. “The sea front was spectacular in the June sunshine,” she says, “and it was a reminder, should one ever be needed, that Swansea’s landscape has recovered in a way that was once thought impossible.” More recently, at a stimulating evening with Morriston Rotary Club members and their wives at Sherwoood’s several ‘behinders’ gave further insight into the role by describing (and acting out) the quick and deft handling required to move metal sheets safely and quickly. The planned events of 2010 were brought to a close with one further event at the end of October: Down the Memory Lanes of My Hafod was on sale again at the Local History Book Fair in Swansea Museum. Organised by Gerald Gabb, the event was a superb occasion and, as last year, the day proved to be a great chance to hear more stories of the Hafod community and its nearby works. It was also a chance to meet new friends, including Barry Evans who has recently recorded J Ramsay Kilpatrick’s words for Swansea and Gower Talking Magazine for the Blind thus enabling a whole new audience to enjoy Down the Memory Lanes of My Hafod. 2010 has been another successful year for WORKTOAD and Felicity is looking forward to meeting up with old friends and new in 2011. November was the culmination of a successful year’s work for ‘worktoad publications’. At the Local History Book Fair organized by Gerald Gabb at Swansea Museum, Felicity met many familiar faces as well as new fans of Ramsay’s book. It was a busy, vibrant fair and the display boards and slide show of Hafod photographs generated much interest. All those who stopped to say ‘hello’ had their own stories to tell of the Hafod, ICI Landore or other non-ferrous works in Swansea. Early on the morning of the Book Fair, the launch of The Swansea History Journal (Minerva) for 2009/10 brought an unexpected surprise as it included a review of Down the Memory Lanes of My Hafod by Paul Reynolds, renowned industrial historian. Praising the layout, and describing the book as “a pleasure to handle”, Paul Reynolds justly credits Jenks of Machynlleth and Cambrian Printers of Aberystwyth. As a consequence of publishing naivety, acknowledgements to both of them were omitted from the book itself. Their high professional standards have contributed significantly to the continuing success of Down the Memory Lanes of My Hafod. A real highlight of my year has been opportunity to share Down the Memory Lanes of My Hafod with history groups and schoolchildren. Earlier in the year I spent a happy morning talking to knowledgeable local people in St Thomas Library, and in Brynhyfred Library where I was lucky enough to meet Ivor Williams, a former work colleague of Dad’s. His enthusiasm for the history of the site of ICI Landore, later YMI and IMI, has been truly inspirational. Fittingly, the year drew to a close with a whole new generation of readers at Pentrehafod School. Invited by Geoff Rees, Assistant Headteacher, I spent an uplifting hour with a group of Year 10s introducing them to the importance of the area in the world’s industrial history. 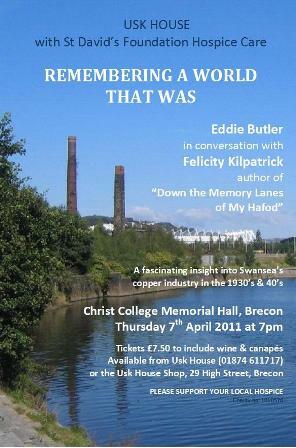 I’ve been invited to return in 2010, this time to introduce local teachers to the history of the copper industry through Down the Memory Lanes of My Hafod. My journey of discovery continues, and I am now pursuing further research with a view to completing another project about the area. Each day brings new insights into the world Dad recalled and it has been wonderful meeting so many interesting and interested people. To all those of you who have been part of my magical journey—thank you. The success of Dad’s book has meant so much to me, and Mum and Dad would have been tickled pink! 2011 has been an exciting year all round. 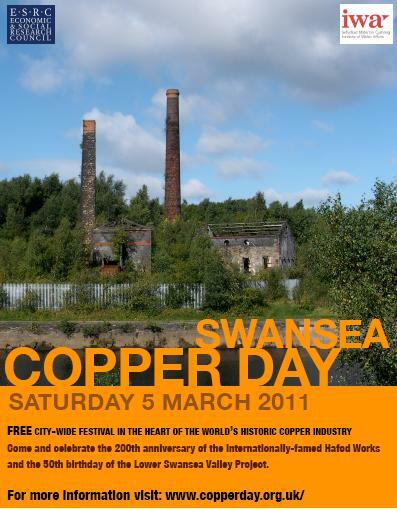 Copper has been in the news for all sorts of reasons, most recently because of increasing incidents of the theft of copper for scrap - a reminder that copper is a precious metal and important metal, a fact that was very much the theme of the extraordinary experience that was Swansea's 'Copper Day' on March 5th. A celebration of Swansea's links with the industry, it was a stimulating and activity-packed day. There was standing room only at Landore Social Club where former ICI and YIM employees and residents of the Hafod community came together to share memories with Ivor Williams and hear 'My Hafod' by Felicity Kilpatrick. Elsewhere in Swansea, large groups of people could be seen as they followed one copper trail or another through Hafod streets, through the site of the Hafod works and the White Rock works as well as through the National Waterfront Museum and Swansea Museum. The day showed the strength of feeling people have about the industry that has hidden itself for so many years. At the end of the day we all understood that we were all in at the beginning of something really special. "The change in what I can say about the old works site has altered dramatically since those early talks in 2009," says Felicity Kilpatrick, "and it is a real pleasure to be able to share a brighter future with people who ask questions about the site." 2011 has indeed been an exciting year all round. A fund-raiser for Usk House with St David's Hospice Foundation Hospice Care in April led to Felicity being invited to meet with Roy Noble again in his Cardiff studios. 'Dravers' were very much in fashion for the day as she engaged listeners with stories heard during the last two years from readers of Down the Memory Lanes of My Hafod. From knowing nothing at all about these garments, Felicity is now the proud owner of Welsh flannel 'dravers' made at the Teifi Mill and was able to share these and other artefacts, including a lump of heavy clinker fused with copper slag, with Eddie Butler on April 7th. Eddie Butler proved himself to be a popular conversationalist for the evening and his own historical interests opened up new avenues for discussion during the course of 'Remembering a World that Was'. The event, including the sale of raffle tickets for a pre-Premiership Swans match generously donated by the Liberty Stadium, raised just over £1,000 for Usk House with St David's Foundation Hospice Care. 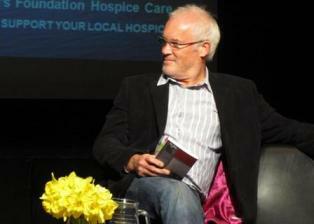 "I was delighted to be asked to be involved in an event that would raise money for this local charity, says Felicity. "Once again, Eddie Butler was a real gentleman and we were all very grateful for the way he willingly supported the evening. " Three more events during the year, each with their own significance, made for another busy year for 'worktoad' and Felicity Kilpatrick. The first was an afternoon speaking to a packed house at the invitation of Treboeth History Group. This was particualrly special because it was a chance to say a public 'thank you' to Ivor and Mor Williams for all the enthusiastic support they have both shown since the publication of Down the Memory Lanes of My Hafod. The group is currently working on its own publication, a history of Treboeth - a volume to look out for in 2012. A further visit to Pentrehafod was a welcome return to the heart of the community that is described in J Ramsay Kilpatrick's words. The Local History Book Fair in October was the last that would see sales of Down the Memory Lanes of My Hafod. With very few copies left, there will not be enough to merit a table there in 2012 but who knows what future years will bring! "You've done it now!" These were the words Dad often said when I made a leap into the unknown, and these were the words that came back to me in December 2008 when a pallet of boxes of Down the Memory Lanes of My Hafod arrived. At that stage I had no idea what would happen next, and I had no idea whether people would like the book let alone buy it. Little did I know that the next few years would be filled with magical moments and stories from new acquaintances and old friends. All worktoad's copies of Down the Memory Lanes of My Hafod are now sold and I can say, "Yes, Dad. I've done it"! So it gives me a real thrill to be able to say that Swansea is very different from the place I re-visited in the early days of putting the book together. Thanks to the work of all those involved in the World of Welsh Copper project, the regeneration of the Hafod-Morfa site is imminent. As recently as 2008 it felt as if Swansea's links to copper were known only to the few die-hard individuals who knew that Swansea had a story to tell the world; today copper is the word on the lips of everyone in Swansea. As I bring to a close the project I worked on with my father, the future is copper-bright with possibilities. For people of Dad's generation the clouds of the industry seem to have lifted and, more than ever, people of other generations are ready to hear their stories. It makes me very proud that Dad's words will continue to contribute to an understanding of the place he loved - the place I came to know through his stories. "To all those of you who have been part of my magical journey—thank you. The success of Dad’s book has meant so much to me, and Mum and Dad would have been tickled pink!" In the early days of listening to Dad's works stories, it became clear that the Hafod and the Hafod-Morfa site meant more to Dad than I ever realised. In my ignorance I hoped that Swansea would tell me its own story but, in those early years of research, I soon discovered that she was well-practised in keeping her past well-hidden. Seeing signs to 'Copper Quarter' on a visit to Swansea in 2007, I was ecstatic to discover that there was a centre where I could find out more about the industry that I knew so little about. Local people laugh knowingly when I tell them this - 'Copper Quarter' was simply a marketing name for a new housing estate!